If you are looking for a great camping destination that’s not too far from home, it’s hard to beat the beautiful regions of Holland in the Netherlands. It is no wonder the Dutch are renowned campers as camping here is a great way to enjoy the tulip fields, canals and windmills that give the country its unique charm. From fascinating cities, stunning sandy beaches, an impressive variety of museums and other attractions, it is a region with a lot to offer. Our campsite in South Holland, Camping Duinrell, has plenty of facilities to keep you entertained, with a fantastic tropical water park and its own theme park. It is also a great base for visiting some of the Netherland’s best attractions such as Amsterdam, The Hague or the Keukenhof gardens - one of the world’s largest flower gardens. Looking to make Holland your next camping holiday? Check out our campsites in Holland below or call our knowledgeable customer advice team on 0345 268 0827. There are loads of popular areas for you to explore during your holiday in Holland and within reach of our Dutch campsite Duinrell. The capital, Amsterdam, is one of the most diverse and vibrant cities you’ll visit in Europe. It’s home to world famous museums, like the Rijksmuseum and Van Gogh Museum, with a rich artistic and cultural heritage. 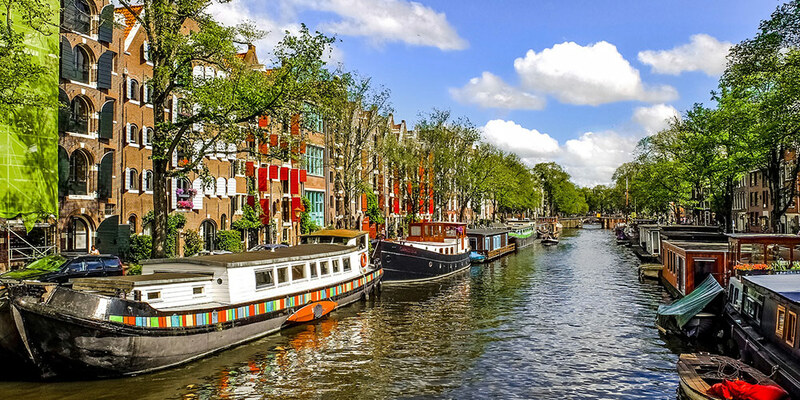 Why not hop on a bike or take a memorable canal tour to explore what Amsterdam has to offer. 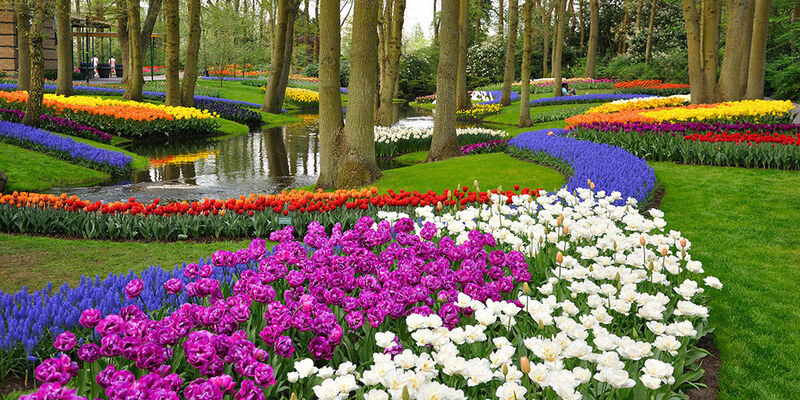 The beautiful Keukenhof gardens in the town of Lisse, just outside of Amsterdam are filled with the national flower, tulips. The gardens showcase flower bulbs from 100 participating floricultural exhibitors who display their living catalogue at Keukenhof each year. Visit during mid-April and May to be sure of an endless supply of tulip photographs to share with your friends. Outside the gardens, the town of Lisse is surrounded by hundreds tulip fields producing flowers for the international market. These long, multi-coloured strips of land are astoundingly beautiful and easily accessible by bike. The Hague is one of the most exceptional cities in Holland. Not just because it is seat of the Dutch parliament, but also because of its many monuments, historic districts and its location near the beautiful North Sea coastline. It’s also a great place to learn to surf! Visit the theme park at Duinrell for a rollercoaster of a day out. Daredevils will love thrilling rides like Splash, Falcon and the Water Spider or, for younger children, the chance to meet Rick the Frog. With over 40 attractions there’ll be sure to be something for the whole family to enjoy. Check out some of the best waterslides plus indoor and outdoor pools at the amazing tropical pool complex at Duinrell. From the 'higher than it looks' pelican dive to the terrifyingly quick Cycloon, there are is plenty to keep the whole family entertained, come rain or shine. Visit the charming village of Wassenaar and try out what could quite possibly be the best Ice Cream in Holland. A 10 minute walk from our campsite at Duinrell, picturesque Wassenaar is home to the King of the Netherlands and his family. This beautiful village has a wide selection of shops, bars and restaurants to explore, not to mention the ice cream. Rent a bike and pedal 4 kilometres (about fifteen minutes) from our campsite to the beach at Wassenaarse Slag. The white sandy beach stretches for over 8 kilometres and is the perfect place for families to spend a day at the beach.